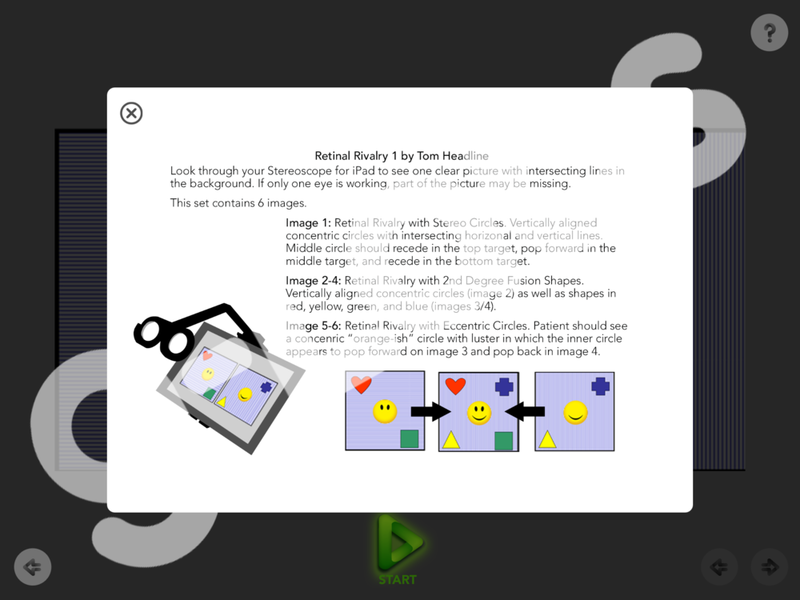 Description of the "Headline Retinal Rivalry" exercise in the Opto vision training app for iPad. A G-Labs collaboration with Tom Headline, COVT. Headline Retinal Rivalry is a G-Labs collaboration with Tom Headline, COVT of Headline Vision Enterprises. This activity consists of targets with retinal rivalry progressing through a series of six flat fusion, luster, and stereoscopic images. How to Purchase: Available as an in-app purchase in Opto, the vision training app for iPad. Download Opto and find "Headline Retinal Rivalry" in the in-app library of exercises. Available as an individual exercise ($12.99 USD) or at a discounted rate as part of Expansion Bundle 2 ($69.99 USD). Download Opto for iPad to access the "Headline Retinal Rivalry" exercise.